I Mistakenly Spilled Water On Your Laptop while I was playing music with my personal computer, and I went out to check who is knocking on my door, then in the process of getting up, my teacup mistakenly poured right at my keyboard, I was totally angry with the innocent visitor knocking at my door to the extent I didn't give my visitor the quality time I would have given to him/her, because I thought it was their bad luck that brought about the pouring of the tea. 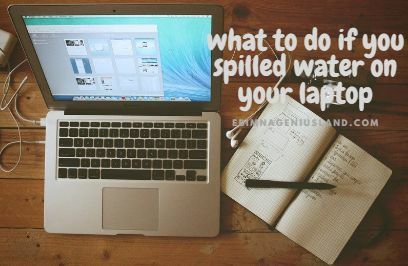 The Best thing to do is to stop the hail of the blame and start working with us if you truly mistakenly spilled water On your laptop. You have to stop blaming yourself or even your visitor because that time you were there frowning and being in angry mood was the time you would have used to fix our PC, even right in front of your visitor, while the both of you have a nice time together before they vacate. Therefore, all you need to do is to follow the steps written below in order to save your Pc, if you experience such thing again, r maybe you know someone that experience that around you. It's very important that when you mistakenly spilled liquid on your computer, the first thing you have to do is to quickly unplug it, shut it down and remove the battery instantly. there is no need of looking at it, shouting or screaming. You might even have to trouble, shoot the PC because following the due process before shutting it down might cause more damage. Therefore I advise you to quickly press the power button immediately to shut it down. * Quickly unplug the charger from the Pc, then remove any cable plugged directly to the system, which might be your mouse, your USB cables, and your er phones, your flash drives, modems, and DVDs. leave your Laptop unclad. * Out Dry Your PC Immediately by putting the computer up-side-down, look for a dry clean material to dry it up immediately, instead of admiring the Pc, While the sugary liquid harms the PC more. No need to be there thinking of which engineer to take your pc to. Water is at least corrosive to damage of your computer, to compare to that of sugary liquids, therefore if you can't help yourself in taking this steps, quickly rush your P to a nearby computer engineer. if you can do it yourself, then take the actions immediately by acting once like a computer engineer boldly and encouragingly. This is really where it gets a little bit tricky but you don't need to give up, just stuck with it and make it count, in a way of breaking record too. If you haven't done this yet, Do it now: Remove your battery first, unmount your keyboard, the top panel and every other USB drive attached to the USB ports. Also, don't forget to remove your motherboard, you can make use of your manual in the system package when you bought it if you don't have one, don't worry, we get you covered. * Get A small screwdriver and a table knife and also acquire small thin flat tools. The screwdrivers will simply be used to loosen the nuts, and screws while the table knife will be used to take off the covers, after losing the screws. * Be careful with it in case your device has a data cable in the back so as not to damage or rip it off in the process while losing the nuts with the screwdriver. * Also, carefully pull off the cover using the table knife and avoid using force to pull them, in case if there are any screws remaining so that you won't spoil or damage the cover while trying to forcefully remove it. * Pull off the keyboard with the cable and make sure you do it gently to avoid pulling the cable under the cable from tearing apart. You must be careful and petty with the keyboard because once the cable connected under the keyboard is shattered, you will request for an engineer. When done with the keyboard, set it aside. * Straight to the motherboard, check if it's dry and then let it be if it's wet, the first thing you must have to do is to put on a wristband, to prevent an electrostatic discharge which could destroy your device. * Dry them off: WHile trying to dry them up, please be warned and abstain from using hair dryers to dry them, this may cause static problems to your device. here are several simple ways to let the device get dried easier and healthier to the system in the quotes. Examine all the components that you have removed from the device to check if there are wet portions, and never forget to dry them up, with a dried cotton or handkerchief. If there is any sign of corrosion discovered, you just need to go quickly grab a toothbrush and then dip it into an alcohol to dry off the excess liquid. Very important, don't forget to keep your screen dried too. If you desire to know the healthiest way of drying them off after cleaning the wet phases, just place them under a fan just for at least three days to enable it to dry well and make sure no other liquid is around the corner where you left it. * Cuple them back to their various positions using the process and procedures you used while dissembling them to assemble them back to their normal positions too. I have a strong belief that all will be well after all these processes, but if your keyboard is no longer functioning well, you might want to take it to an engineer, or you can go online and purchase a new keyboard to change the old one, all by yourself. What If Your laptop Cannot be taken Apart using these procedures? All you have to do is to quickly take the pc to an engineer, who must have all necessary pieces of equipment which you might not have to dry them up for you and bring your system back to life before it's too late. WOW, THIS WAS VERY HELPFUL TO ME, i ALMOST GAVE UP ON MY PC THIS MORNING, BEFORE I GOOGLED THE POST AND READ THIS, FOLLOWING THE PROCEDURE WAS THE ONLY THING THAT LEAD ME THROUGH. THANKS SO MUCH EBIMNAGENIUSLAND.